It believes the birds were killed illegally and their tags destroyed. Following the latest incident, the Scottish government has ordered a review of bird satellite tracking data to try to determine whether there is “a pattern of suspicious activity”. The first of the eight eagles vanished after last being recorded in the hills above Strathdearn in November 2011. Further disappearances followed in 2012, 2014 and then this year. A two-year-old female bird nicknamed Brodie is the latest to disappear. 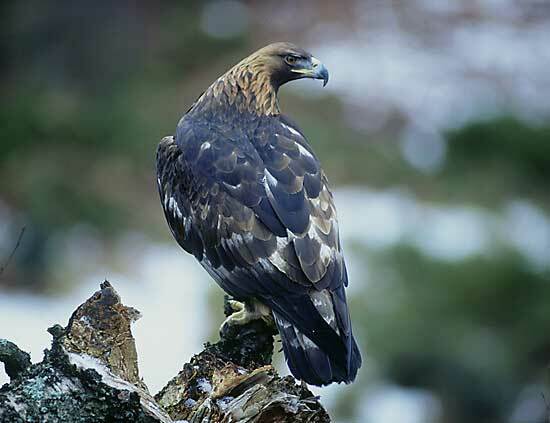 RSPB Scotland said the last recorded position placed the eagle in the northern Monadhliath mountains on 2 July. The birds were being monitored by RSPB Scotland, Highland Foundation for Wildlife, Natural Research Ltd and Forestry Commission Scotland. Satellite tagging allows conservationists, scientists and others to track birds’ movements and to better understand their behaviour. Searches were made of the locations where the eight eagles’ transmitters sent their final signals, but nothing was found. RSPB Scotland’s head of investigations, Ian Thomson, said the majority of tagged birds of prey disappeared in areas “intensively managed” for shooting game birds, such as grouse. He said the “positive efforts” of landowners and estate owners who support golden eagle conservation were being harmed by “those who have a complete disregard for the law”. Mr Thomson said: “Given the reliability of the transmitters, the chance of so many birds disappearing over such a short timescale without some kind of human interference is so small as to be negligible. Scottish Moorland Group, an organisation involving landowners and gamekeepers, said there was “no clear evidence” that the eagles had died. Director Tim Baynes said: “Our organisation is an enthusiastic member of the Partnership forAction Against Wildlife Crime and our members are committed to golden eagle conservation across Scotland. “There is no clear evidence of the golden eagles having even died in the Monadhliath area, letalone having been “persecuted” on grouse moors as RSPB is alleging. He added: “There are other explanations for satellite tags stopping working and the failure of RSPB to involve land managers in trying to establish the facts is disappointing. Roseanna Cunningham, the cabinet secretary for environment, climate change and land reform, said the disappearance of tagged birds would be investigated. She said: “The latest reports of satellite-tagged golden eagles disappearing on or near grouse moors are very disturbing and disappointing. “Grouse moor management does help species such as curlew and golden plover as well as generating much-needed rural employment and income but this cannot be at any price. Ms Cunningham added: “As previously stated, the Scottish government is prepared to introduce further regulation of shooting businesses if necessary. Turbines in that particular area are on the increase have been for the last decade just a coincidence do you think?